The Finger Lakes Sweet Treat Trail is a collaborative, county-wide trail of locally produced foods and beverages. 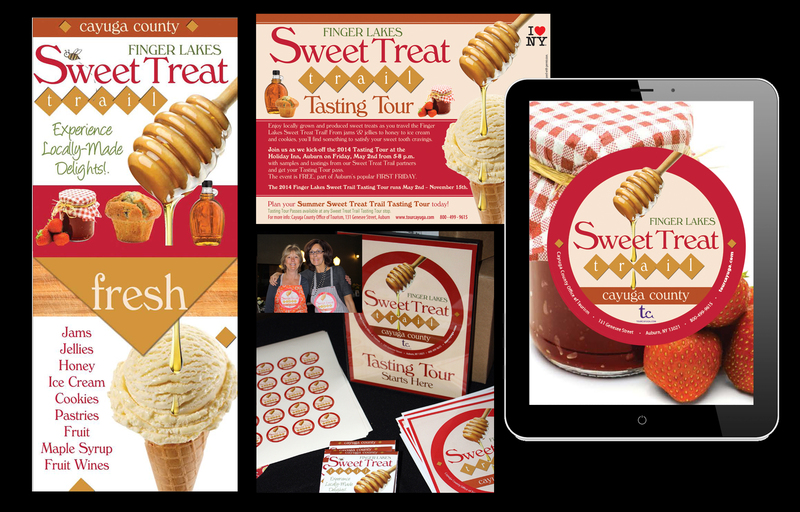 I worked with Cayuga County to extend its brand with the new promotion, creating a logo, brochure, tasting tour passes, posters, signs, product labels, ads, and banners. The goal was to promote a unique, memorable, and purely local Finger Lakes culinary experience. With the pieces created, Cayuga County welcomed 2,147 documented visitors to the Trail in 2013, and garnered significant media coverage and awards.